Top-level former test takers whose brains were picked to develop a highly “exam-accurate” Praxis Core practice exam and razor-sharp ‘test-like’ Praxis Core Study Guide? This choice in highly experienced and specialized Praxis Core knowledge isn’t tough, is it? Having the opportunity to tap the brains of real teachers who passed the Praxis Core Academic Skills For Educators test will make your test preparation less stressful and help you get a passing score quicker. Whether teaching is a second career for you or you are taking the test after just finishing college, passing the Praxis Core Academic Skills for Educators the first time can be achieved. Look at the blogs or read test prep reviews on Praxis Core practice tests. Many test-takers complain they didn’t know what was going to be on the test! Others complain of wasted time and money for Praxis core test practice materials that didn’t help them pass. Some even wonder if their practice exams caused their failure. Finally, this test is high-stakes. Fail the test and you must wait to retake, hoping you will pass the second time. Or the third time. Failure can be frustrating, but it can also mean that you may miss the chance to have your own classroom any time soon! You can pass the Praxis Core if you follow those simple strategies! It’s foolish to go into the Praxis Core without knowing what is on the test—especially when it’s so easy to find a map of each test on the Educational Testing Service website! Praxis Core Reading 5712 (85 minutes): selected response questions based on reading passages and statements test Key Ideas and Details; Craft, Structure, and Language Skill; and Integration of Knowledge and Ideas. Do you think reading is your strongest skill? Think again! You may not know until you look deeply at possible questions and answers on the test. Remember that the test expects you to analyze, assess and evaluate. The test may be called Core, but these are upper level skills. Choose a study guide with a Praxis practice questions that includes these upper level skills! Praxis Core Writing 5722 (100 minutes): selected response questions about usage, sentence correction, revision in context and research skills and 2 essay questions. ETS labels the two areas tested as Text Types, Purposes and Production and Language and Research Skills for Writing. Here, it is important that you understand the types of Praxis Core questions that could be asked and the expectations for your written answers. A quality Praxis core practice test pdf, paper or online version will show you how the constructed response, or essay questions are scored. The book should also give you lots of practice tests that include language skills. Each answer (both correct and incorrect) should be explained in detail for you. Praxis Core Mathematics 5732 (85 minutes): selected response questions may have one or more than one answer. You will also have numeric entry questions in these categories: Number and Quantity, Algebra and Functions, Geometry, and Statistics and Probability. Many candidates who have to retake a portion of the test comment on the difficulty of the Praxis Core math test. Even though this is a Core test, the level of mathematics expected in upper elementary and middle school grades is difficult. Look closely at the explanations of math problems of any Praxis Core practice exam material. Is there information that provides test practice for volume formulas, basic equations and linear equations? Because this part of the Praxis Core Academic Skills for Educators poses problems for lots of test-takers—some for the second or third time—the best Praxis Core exam practice will give you lots of opportunities to review these skills over and over again! 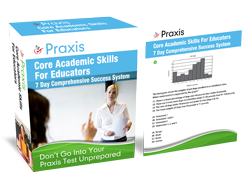 The following Praxis Core test preparation resources and cheat-sheets provide insights and tactics that help you pass the Praxis Core Academic Skills for Educators quicker and in less time. The candidates who have taken the Praxis Core (or parts of it) multiple times have great advice. The Praxis Core sample tests you use needs to. . .
be current. Compare editions with the Educational Testing Service details for the exams. Has anything changed as the actual test changed? contain information that may be on the actual exam. This seems simple, but many candidates have used Praxis Core practice questions that are nothing like the exam! What a waste of time! have the same format as the actual test. Are questions worded like the ones on the real test? explain reasons answers are correct AND incorrect. This helps you spot patterns of words or phrases in answers when more than one answer seems correct. You don’t have to guess whether Praxis Core practice exams will help you. The research has already been done. Praxis core practice tests are some of the most effective ways to improve test scores. Taking a Praxis Core practice exam is almost always a more potent learning device than studying the target material. (https://ies.ed.gov/ncee/wwc/Docs/PracticeGuide/ 20072004.pdf). A good Praxis Core practice book should also give you test-taking tips. Read through them. The tips may help you gain confidence as a test-taker which can lessen your stress! How should you choose your practice tests? Again, use the research! Once again, choose Praxis Core test prep materials that match the content of the exam. Realize that purchasing outdated materials is not as effective as using up-to-date practice tests. Review the ets.org Praxis Core content page. This links to each tests’ details. These details will show you what is on the test! Read them carefully and use them to choose a Practice Test to help you prepare! Finally, use Praxis Core practice tests as an assessment tool to determine where to focus your time. Study the concepts or the testing strategies that cause the most stress or where you lose points. If a timed test creates stress, use Praxis Core practice questions using the same situation as a test: find a quiet place with no distractions, set a timer and work through sections until you become used to timing. If some Praxis Core questions take longer than others, skip them and come back after answering the easy questions. Though incorrect answers do NOT count against you, unanswered questions can’t increase your score. Why not answer the easy questions first, leaving yourself lots of time for difficult questions? You may have terrific grades in college. You may be the number one person in your office. You may be the best Mom or Dad or Grandparent alive. But if you wish to teach, you need to pass the Praxis Core first. Be successful: find the time to practice! So achieve your goal by accessing the details of the 3 exams; finding a Praxis Core practice test structured like the real test; and practice as many times as it takes for you to feel confident. Set up a schedule that includes a time and place to mimic the real test situation. Keep track of your progress as you take the practice tests. Save yourself the frustration of so many others who have had to retake the test. Practice may take time, but it can make a big difference in your score. And that score can make a big difference in your life. Imagine this: the next time the first day of school comes around, you could be greeting your students in your classroom. Yes, when it comes to taking Praxis Core sample questions (and during the exam), you won’t know the correct answer 100% of the time on your testing date. So what are you supposed to do when you encounter such a terrifying proposition? Should you run screaming into the corner? Should you shrug your shoulders and give up on test practice altogether? Or should you learn Praxis Core test prep strategies that can turn random guesses into bona fide test points? I don’t think you need any help from me to choose the right answer! You won’t find these strategies in any other Praxis Core study guides or practice tests. That’s because these strategies are, from top-to-bottom, generated by the real people: That is former test takers and certified teachers. Most test prep guides are written by lowly freelance writers who only get paid pennies for all of their hard work and effort. You may have heard of guesstimating before – the art of making the educated guess. But trust me, none of those review strategies don’t compare to what you’re about to read here. Not sure what answer to select on that ETS test question? Here’s a hint: The best practice in Praxis Core Academic Skills For Educators test taking is to go for the longest answer, or the one that has been packed with the most information. Studies have shown that this exam tends to favor exam answers that contain the most information. Identify wrong answers easier by spotting these trigger words: “always”, “none” “everyone”, “not at all”, and “every”. Any good Praxis Core Academic Skills study guide worth its salt should teach you to look out for these key words, as they’re the biggest indicators of a wrong answer: In fact, the most general and simplistic the answer, the more likely it is that it’s wrong. Don’t select exam answers that bring in outside information. Stick to what’s written in the passage. If you draw a complete blank and cannot eliminate at least 2 wrong answers then select “C” for every answer you’ve left blank. You’ll greatly increase your scoring chances if you do this!